NEWPORT, R.I. – Problem: We need to publicize our historic site so more visitors will come. Solution: Ask a TV channel to make a show about our site. This September, JBS, the Jewish Broadcasting Service, aired “The Touro Synagogue.” The show will feature the oldest standing synagogue in the U.S., Touro Synagogue, completed here in 1763. 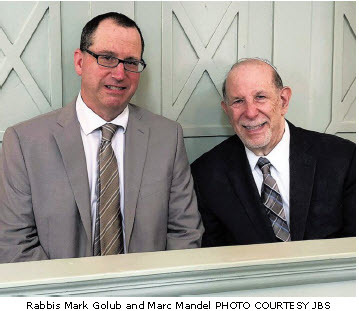 Rabbi Mark S. Golub, founder and president of JBS – formerly Shalom TV – JBS vice president for marketing Edith Samers and a camera crew spent July 17 visiting the shul with Rabbi Dr. Marc Mandel and docent Lew Keen of Touro’s Congregation Jeshuat Israel. Getting from problem to solution began with brainstorming by the board of the synagogue’s Touro Foundation. A couple of members who knew Rabbi Golub offered to approach him about featuring the synagogue on JBS, which is dedicated to Jewish topics and has a tremendous reach. Rabbi Golub agreed. “It is important to tell the story of the significance of Touro Synagogue to JBS viewers who may know little about it,” Rabbi Golub said. 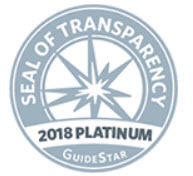 “I have always had a connection to Rabbi Mark Golub and his media platforms,” Rabbi Mandel said. “My children and I used to watch Shalom TV together. They loved the jingle, ‘You’re watching Shalom TV.’ It was an opportunity for us to watch something with Jewish content together. Rabbi Golub has been involved in media since college. While an editorial director for New York’s radio station WMCA, he was assistant editor of the Reform journal of ideas, Shma, and worked for a Havurah in Stamford, Conn. In 1979, he created a weekly Jewish radio program, L’Chayim, which is currently on JBS. In 1991, with Michael Pravin, z”l, Rabbi Golub founded RTN (Russian Television Network) for Russian immigrants to the U.S. While a secular station, most of RTN viewers are Jewish. The show will air on Sept. 19 at 2 p.m.; Sept. 20 at 1:30 p.m.; Sept. 22 at 7:30 p.m.; and Sept. 23 at 2:30 a.m. JBS appears on FiOS 798 (primarily in Boston); DirecTV 388; Roku in Massachusetts; Atlantic Broadband in Maine; and Ch. 76 in New Hampshire. 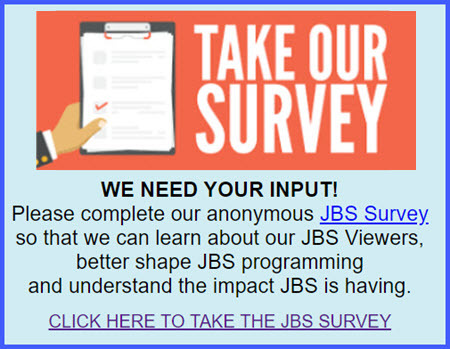 JBS also streams on jbstv.org.